When dealing with an iconic corporation like Google, the design process begins with embracing the organization’s culture. After all, that culture is what permeates every aspect of the company – including its global vision, its brand presence, its team members, and its new tension membrane structure. 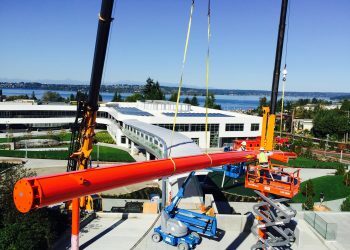 Google announced its plan to double the size of its Kirkland Campus, and it wanted a centerpiece that was just as unique as the company itself. In partnership with DLR Group, the project’s architectural and engineering firm, and SRM Development, the property owner, the team at Eide Industries set out to create a one-of-a-kind, non-symmetrical tension membrane structure that aligned with the campus’s cutting-edge, fun, and inspirational vibe. The original project design faced certain challenges, so the team at Eide Industries was brought on to employ our specific fabric architecture expertise in the design-refinement, fabrication, and installation phases. Here were just some of the highlights of the project. Adjusting for Load Requirements – Early models of the Google Campus tension membrane structure called for a flat canopy, but snow load requirements needed to be addressed. 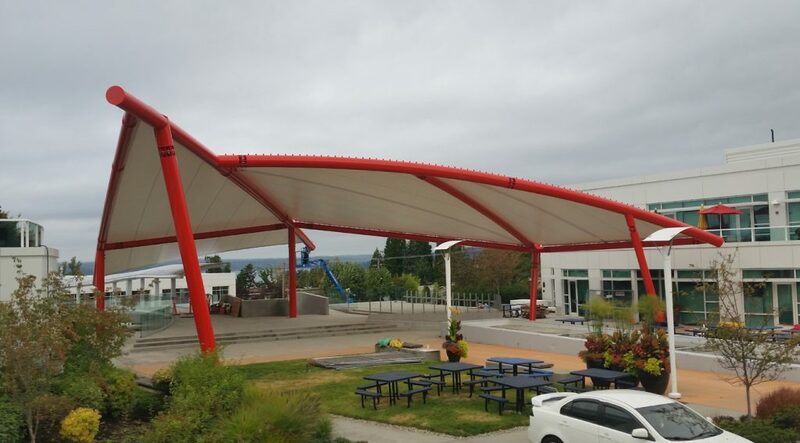 This shifted the design to include a 25’ extension on one end of the canopy, creating a captivating sweeping effect that’s both visually appealing and functional. Achieving the Artistic Vision – To accomplish the architect’s concept of a “free-floating” canopy with a two-foot gap between the fabric and the frame, our team introduced a series of threaded rods. This not only accomplished the artistic vision but also maintained the structure’s engineering requirements for withstanding 85 MPH Wind Loads. Additional cables were introduced into the canopy to support its slope and prevent water ponding, and rain diverters were incorporated into the top membrane cover to re-route runoff water away from pedestrian walkways. Overcoming Foundation Challenges – Traditionally, the existing 14” thick concrete deck would have been strong enough to support this type of lightweight design. However, we were building the tension membrane structure above the campus’s new two-story underground parking structure. 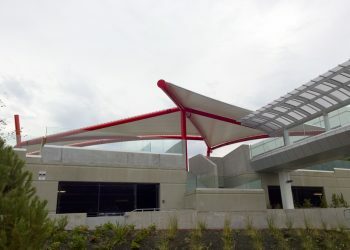 To overcome this challenge, the five upright canopy support columns were strategically attached to the underground concrete pillars in the parking structure – ensuring the structure’s stability without adding more support columns. Creating a Professional Installation Plan – Prior to the installation phase, our team developed an installation plan to overcome some significant accessibility issues. Using two large cranes located on surrounding service roads, frame pieces were held in place throughout the installation process instead of being supported from below. The collaboration between DLR Group, SRM Development, and Eide Industries resulted in a monumental tension membrane structure that stretched 93’ by 96’ across the campus’s main courtyard. 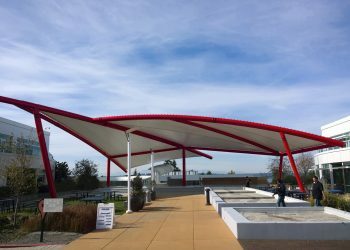 The white Serge Ferrari 1202 T2 PVC-coated polyester membrane contrasted perfectly with the “Google Red” frame finish that was applied to the structure beams – creating a truly iconic, functional piece of art that can be seen from nearly every corner of the Google Campus. Is a Tension Membrane Structure Right for Your Next Project?